The power of Google searches has always had an Achilles heel: terrible connections. Whether you have little to no mobile signal or less than stellar WiFi connectivity, you know the frustration when you're trying to look something up. 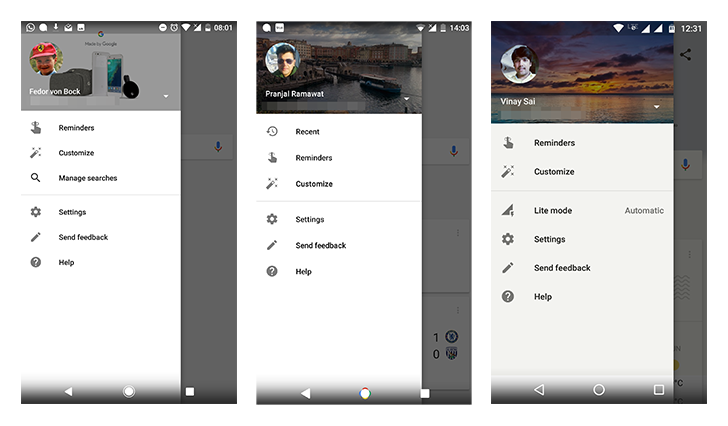 There is nothing to counter this, but Google has officially rolled out an "offline search" feature which will deliver your searches to you when an adequate signal becomes available. Google is on a testing spree with server-side changes in the main Search app. Based on feedback from several readers, it looks like there might be changes afoot to the side menu, introducing a new feature and improving on ones we've seen before but that haven't been widely implemented yet. Whenever you perform a search within the Google app or widget, you have a couple of ways to access it again: you either remember the exact words you used and try the same search, or you access your Google activity dashboard, or you use the trick of tapping the Google icon to open a consequent search as a separate page to leave the previous one lurking.